Albany, NY, 4/5/2002. Used with permission. Click here or on photo for additional pictures. 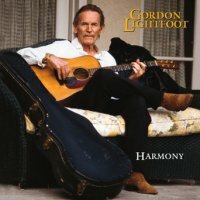 This will be a great year for Lightfoot fans, with a stream of new recordings hitting the stores and a more extensive tour schedule than in recent years. On January 29, his Live In Reno video was released. Available on both DVD and VHS videotape, this is the very first Lightfoot concert video ever. Then, on April 2, Rhino released a beautiful, new, Complete Greatest Hits album. This album, brilliantly remastered by Rhino's Bill Inglot, brings together Lightfoot's most well known hits onto one CD or cassette. Later this year, Rhino plans to release the "Final Four" original albums, never before available on CD. G: As far as the writing goes, I keep working at that ... constantly. We have had a couple of pretty good repackages here over the last couple of years. There was the anthology (Songbook boxed set) and now we have the Complete Greatest Hits album coming out from Rhino. I've continued to write so I hope to make another original album. V: Where do you stand on that? G: I've got quite a new bunch of stuff here. It's going to take a little time to get it learned and get it down. I could start recording, I hope, by the end of the year, and hopefully get it out the year after that. It's not a question of urgency at all. It's just (a question of) doing it well. I'm just very happy that I'm going to be able to do it and, having had the the outflow that I've had this year in terms of the songwriting, I will be able to do it. V: How much have you written? G: Well, I don't like to get into numbers, but there's a lot of stuff here. We're looking at a CD of 12 songs - 12 to 14 songs, I suppose. That's what it's like these days; 10 used to be the magic number for an album - when we were doing them in vinyl. But with the CD, you're expected to show a little bit more. There's more than enough, let's put it that way. I've been talking about it because we've been introducing some of the stuff on stage as you have seen and I hope that I can get two or three more worked into the show. V: Might we hear some new ones as soon as this March or April? G: I'm not quite sure. V: I guess I might have to wait until Massey then? (Gord is scheduled to next perform at Massey Hall in Toronto for four nights, November 13 to 16 of this year). G: It would be very, very nice to have some to do at Massey Hall. The new album, Harmony was released on May 11, 2004. It was made using practice tapes Lightfoot had recorded in the studio, with the additional parts of the arrangement recorded later while Lightfoot was recovering from a serious illness that almost killed him. G: The fellows played very well. They outdid themselves on that one. V: You did okay, too. G: Well, thank you. I played my part. We spent some time getting ready for that. We actually put quite a bit of thought into that show before we did it; maybe a little bit too much. V: No, I don't think so. I know that in the months before (the taping), each concert was kind of a dry run. V: Why did you wait so long to do this? G: I don't know. Mostly it was a matter of timing. It was who we were going to get to do it and where we would do it. We sort of bounced that around. It wasn't an earthshaking thing. I wanted to do it, but I was just waiting for the right moment. I think I said at one time (that I would do it) "while I still have hair". So we did it and it's done and I'm glad it's done and in its place. There it is for posterity. V: People have asked about a CD. Have you given any thought to that - putting that concert out on CD? G: You know, it probably would be good enough to do that, but there's no great crunch to do that, really. We have what they call a "Complete Greatest Hits" coming up, and we have the four CDs coming out. I would rather get some really choice takes out of the Massey Hall concerts and I've been doing that for the last couple of years. I'd like to have a Massey Hall concert maybe a little bit later on, just in case, by some stretch of the imagination, we might have to retire, or something like that. That's one thing about this business, you know, - as long as you have the intestinal fortitude to continue, you can stay if you want to. V: From what I can see, you guys have really been enjoying it. If anything, the concerts have been getting better - (each year is) better than the year before. G: One of reasons why it sounds better, Valerie, is that we've been getting scientifically involved in tuning the instruments, in getting them locked in with the keyboards. And that is something that has gelled in just the last three or four years. It has taken 35 years for it to get to that point! V: So what do you do differently? G: It's got to do with the fine tuning of the instruments. You have acoustical instruments and we do still played capoed music because we were married to that during the folk revival back in the early 60s. What you do in the recording studio using a capo, you have to take it to the stage. When you start to move the capo while you're on stage, the guitar goes out of tune. It's a very careful and exacting process. We're working on it; it's improving. That's why we think it sounds better. We're going to keep it that way, too. G: That idea was conceived about a year ago. If I had gotten in sooner, on the initial planning stages of this, I probably could have done more rotation of the support material - what I would refer to as the support material of the CD. As it was ... I just got to make one change. I wanted to make five or six, but that's the way of the world. V: What change was yours? G: We took Talking In Your Sleep off their list and we put in Restless at the end. We have a wonderful take of Restless and I love the song. G: It's a good raw performance, done having not known the song all that well, and yet it sounds pretty much together. It's the original studio recording. Does it have the feel? Yes, it's got that feel it has at Massey Hall, and all the great halls that we play around North America. V: So most of the songs were picked by Rhino before you got into it? G: Before I got in. I got into it too late. They caught me at a busy time and I wasn't able to come in with my input until about five months too late. They have a schedule to follow, and we're very happy to have a slot. We're very, very happy to have a slot. V: I'm happy to see that CD come out. It brings together most of the important songs onto one CD. I'm intrigued by the TV advertising. What's your feeling about that? G: I haven't seen any of it yet and, if and when I do, I shall (he laughs) ... it will all go by so quickly that ... who knows, I may even like it. (Laughs again). V: Well, we're all planning to watch TV at all hours to try to catch those ads. It will be fun to see. V: I'll bet you're happy to see those. G: Yeah, I think those were all worthy albums. I know that one of them (Salute) was produced by Dean Parks, the guitarist. He's a very good producer. It's a good album. G: He played guitar on my Shadows album before that; he came up from Los Angeles to do that. Then I flew up there. We worked out of his studio in Los Angeles. That was the first album I made after I stopped drinking. G: Then there's Old Dan's Records which is kind of an interesting old album. And Dream Street Rose. A heady album (laughs). And Shadows. Shadows has got some good tracks in it, I think. V: You perform most of the songs from Shadows in your concerts today. G: Funny, I never think about that one. I remember mixing that out at Richard Terry's studio out at 60 Melrose Avenue out in Los Angeles. We met Tina Turner that day. I remember she was working in the other studio. It was just at the dawn of her comeback. The "Final Four", like the rest of the Warner/Reprise original albums, were allowed to go out of print in the US in 2009; however, most of them were re-issued by Wounded Bird in 2011, and Warner Music Canada has recently kept most of them in print, although not the "Final Four". However, in a bit of good news, a UK reissue label released three of the four "Final Four" albums on a 2 CD set which I sell directly here. V: Let's talk about the Internet. What do you think of it? G: What do I think of it? It's unstoppable. It's unstoppable. That's what it is. As it should be. And so it should be. V: Do you use a computer? G: No, but my son certainly can (laughs). V: All kids can these days. G: All of my sons can. I'm on the Internet highway. V: But you don't use it yourself? V: Have you looked at my web site? G: At the office I have. The idea of an interview for my web site originated back in October, 1999, at which time Gord said that he had things he wanted to say. Because of that, I started the interview by asking him what that was. I doubt he could remember what he might have been thinking about so long ago, and his answer was characteristic. He talked about touring - something that is always in his mind. G: People always ask me if I don't get tired of touring, and the answer is definitely no. We really like to tour. We're lucky to be able to do so. I actually would like to continue doing that for as just as long as is humanly possible. V: That's good news because we all hope you do. V: It seems to me that you're touring even a little more than in recent years. G: I'll probably take it back a little bit next year again. We're going to start recording. I'm going to start getting some of this stuff down. But it's going to take awhile. V: Well, if you're in the studio recording, we won't complain about that ... I wanted to mention one thing to you. 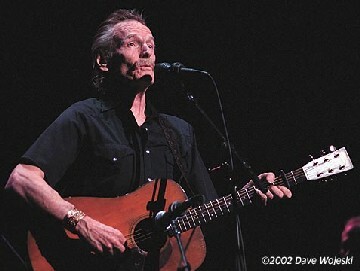 A group of people who play guitar and play your music are going to do a Gordon Lightfoot tribute concert at the Caffe Lena in Saratoga Springs (held March 22, 2002). Do you know Caffe Lena? G: No, but tell them to use their capos well. Tell them all to get Shubb capos. I'm one of the last living hopes for any professional musicians who play with capos. V: Well, most of us do use the capo because we like to play the songs the way you do. G: You know, I had a classical musician come up to me one time and say he couldn't relate to a thing that I was doing. He was watching me up on stage. And that really made me feel bad. V: I wonder what he meant by that. G: Well, you know, the problem with it is, it gets us into some keys. You lose 8 notes off, or what is it? You lose 12 notes off your guitar if you're capoed on the second position. It makes it rough to play with other musicians. That's what it does. If you (are) doing studio work and you're hiring studio musicians, some of them won't play with capos. Some of them are so good that they never use a capo, no matter what key you're playing in. Most of the good studio guys prefer not to. When I take stuff in, I take it in in some crazy keys, because everything I'm doing is capoed on the second position. It's one of those things that you have to live with ... 'cause it pays the bills. V: I bought a Shubb capo when I got my guitar. G: Yeah, they're actually quite mobile. V: I find it easy to use. I still can't play, but I'm trying. G: Well, that finger style thing that I do, I have to practice that constantly. I have to practice that about a half hour a day. If I don't, it goes away. If you don't do it for a couple of days, it actually starts to leave you. V: I don't practice every day yet. I have a way to go. G: I wouldn't even expect anyone to. You have to be involved, you know, so totally involved (that) it's just almost automatic. You know if you don't do it you're going to lose something. Was it Segovia, (who said that) if he doesn't practice for three days, he can hardly play at all. It would take him like a day and a half to get back to where he was. Am I making any sense now? V: Yes. I can understand that a true musician would feel that (way). G: You just have to do it. I do it because I'm a professional and you want to play as well as you can when you're up there in front of the people ... we've got a terrific fan base all around North America, and that's why we come up here ... we feel lucky to be able to (tour). V: You have a pretty good fan base outside of North America, also. I hear from a lot of people (from) around the world. Sometimes I'm really surprised at some of the (smaller) countries ... I hear from a lot of people in the UK. G: We did get to Australia once. We got to Europe once, and over to Britain several times. We got to get out there and do it in quite a few countries. V: Any chance that you might do that (again)? G: Us going abroad? You know, that's a very good question. I don't know if we're prepared to go abroad or not, because it does take a little bit out of you, making trips of that kind. I made those kind of trips when I was a lot younger, you know, and I don't know if I'd be up for it or not, so we'll just have to wait and see. V: Thank you so much (for this interview). I really appreciate it. G: Thank you, Valerie. We'll be touching base with you on the tour and (let me) just say once more: hello to all our fans. Valerie Magee is the webmaster of this Gordon Lightfoot web site. She has been an ardent Lightfoot fan for over 25 years and is grateful to Lightfoot, his band, and his staff for their help and kindness. This interview is copyrighted by Valerie Magee. Any publication or reproduction is strictly prohibited unless permission is obtained from the copyright holder.